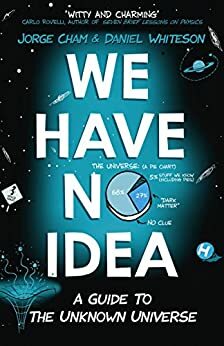 We Have No Idea: A Guide to the Unknown offers a funny and informative romp through the mysteries of cosmology. Each chapter cleverly addresses a key cosmological question, such as whether or not there are higher than three dimensions, what are the missing pieces of the universe's material, and why gravitation is so much weaker than the other forces. Jorge Cham (of PhD Comics) supplies an abundance of hilarious illustrations, each highlighting the absurdity of these cosmic riddles. The science and wit are both sophisticated, relying on a savvy reader to distinguish between truth (as strange as it seems) and the completely ludicrous, such as unicorns roasting marshmallows in another dimension. The book is trippy at times, but so are some of the bizarre ramifications of contemporary physics. If you like your science sprinkled with heaps of sarcastic, far-out, weird humor, it is the perfect book. A truly fun, delightful read! 5.0 颗星，最多 5 颗星Wlly Wonka's guide to the universe. Willy Wonka said a little nonsense now and then is relished by the wisest men. This book is laced with nonsense. But it's profound nonsense. There's little in this book I didn't already know, but now I know it better. What makes this book so endearing is not just the physics and cosmology superbly explained; it contains a quality rarely found in books written by scientists - humility. (Ever try to read a book written by Roger Penrose?) They're not trying to impress with their brilliance and they explain complex subjects with clarity. Instead of "we know more than you and if you can't understand us too bad for you". No, the message of this book is there is so much we don't understand. Can you help us? 5.0 颗星，最多 5 颗星So interesting to read! I can't stop wanting to learn. I feel like a kid again. Share this book like I have. I won't try to summarize anything in the book here - read it to find out, or look at other's summaries. It is rare when I feel compelled to write a review for a book that I'm reading WHILE I'M STILL READING IT. Yes, this such a book. I heard about this book on NPR just before Christmas 2017, as I was about to enter my local library. I found the book on the "New Non-Fiction" shelf and immediately began reading it. Four weeks later (last Friday), I had to return the book because another library patron had requested it. So I bought the book here on Amazon, and it arrived today, only three days later: YAY. Last night, anticipating the arrival of the book, I ordered a second copy for my friend, who always talks about "black holes" (which I learned is not a good term to describe it - yes, in this book). It has been much slower to read this book than I thought it would, because I find myself constantly putting it down to ponder what I just read. And also to look up the footnotes in Wikipedia and Google. Remember (for you old timers) when you used to refer to a dictionary for a definition or spelling of a word, and you would get lost reading the dictionary? That is happening to me again. When I research something in this book, I find myself getting more curious by the minute, and it takes me a long time to get back to the book. This process is taking longer and longer the more I read. That is not a complaint, but it is a fact. I'm only 60% through the book and I've already found that it helps to go back and read an early chapter to brush up on the terms and concepts because some of the ideas are unusual and can be challenging to accept. That being said, if one were to "just read the words", one could quickly finish it since it is only about 350 pages long. So don't worry, if you think this book is anything like a regular text book! That is very far from the truth. The pair who wrote this book, a comedian and a scientist, do an excellent job of keeping one's interest. There are frequent one liners and cute drawings on almost every other page. Ok, back to the book, and to the profound discoveries that I did not know human kind had made AND BEYOND THAT to the concepts and information that humans have yet to figure out, which as it turns out (spoiler alert) is still about 95% of the universe. This book reminds me of grandma's chocolate cupcakes. Fun to consume, made with love, and secretly filled with vegetables. Anyone can write obtuse technical papers on their chosen field. A few truly accomplished people can explain their subject in small words. But it takes deep understanding, a talent for writing and a heaping portion of wisdom to be able to simultaneously explain your topic in small words, maintain a witty pace, and wink at the wonderful hubris of the human race at the same time. My favorite things I hesitate to mention, because nobody ever wants to eat the cupcakes if they are told about the vegetables first. But I do love the way they introduce the vocabulary and basic concepts of physics in an extraordinarily effective way. One barely even notices the learning, yet somehow each time they build on a previous concept the recall feels effortless. Not once, in this remarkable book did I say, "Wait, what?" and have to go backwards to re-read something. Like magic, they would say "Remember x?" and I would. But most of all, this book was fun. I own a sum total of three physical printed books (excluding textbooks - may Pearson Inc rot in eternal damnation for their unholy war on trees and pocketbooks), and this one earned it's place in my tiny bookshelf with it's humor. I wish I could write a glowing review for how the authors made the subject matter accessible and enjoyable for the average person, but I can't. The science is deeply fascinating and remains mostly beyond my comprehension, but I remain very curious about the physical universe, hence why I bought this book. The book did a decent job of feeding that interest without being condensing or by use of impossible to understand jargon. But, the book is full of jokes. Way too many jokes and some of them questionably low brow given the subject matter they support. I made it nearly to the end, but got tired of cringing. To be fair, not all of the jokes were insipid or off topic. In fact, a few were very clever. But all amounted to speed bumps in the narrative and made for an unpleasant read.